Heat exchangers are used in a number of steps while processing juice and milk in the food industry. It is essential that these heat exchangers are free from microbes in order to avoid the occurrence of risks when used by customers. Persistent biofilms can remain stuck especially in the numerous recesses and grooves of the heat exchanger. Thus, aggressive chemicals must be used to regularly clean the heat exchangers. These bring about an increase in the sensitivity for corrosion, especially when mild steel is used as heat exchanger material. The INM – Leibniz Institute for New Materials is now introducing new nano-coatings that help in reducing the effort needed for cleaning heat exchangers and also their corrosion. The research scientists merge anticorrosive, antiadhesive, and, on demand, also antimicrobial properties in these new coatings. The results will be demonstrated by the developers along with the possibilities they offer at stand B46 in hall 2 at this year’s Hannover Messe which is scheduled from 24th to 28th April. 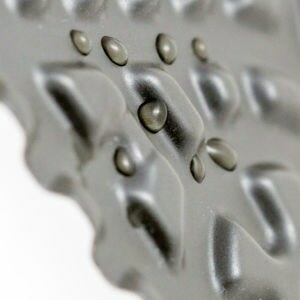 The anti-adhesive characteristics are achieved by the developers with the introduction of hydrophobic compounds that are similar to common Teflon. These compounds inhibit the development of any undesired biofilm and also allow effortless transport of residues before they clog up the channels of the heat exchangers. Structures that act as diffusion barrier are also used by the researchers in the coatings. These inhibit the sensitivity for corrosion caused by aggressive cleaning agents or corrosive substances. Colloidal copper in the coating was also used by the scientist in order to prevent fungus, bacteria or microbes from adhering to surfaces. Copper ions are released from the copper colloids because of the water or oxygen present in many processes. These migrate to the surface and they prevent microbes from proliferation and growth because of their antimicrobial effect. “In addition, we can keep the paint chemically stable. Otherwise it would not withstand the aggressive chemicals that are required for cleaning,” explained Carsten Becker-Willinger, Head of Nanomers® at INM. Further highlighting that the paint could also be adapted for particular mechanical loads, he explained that this was significant for paint used in heat exchangers, too. The individual plates of the heat exchangers could be subjected to a particular amount of abrasion at points of contact due to mechanical vibrations. Becker-Willinger stated that the paint developed could also be used in various other contexts, including the large sector of air conditioning with heat exchangers. The paint could also be used for equipment in water purification plants, for example. Traditional methods such as immersion or spraying and subsequent hardening can be used to apply the paint. The paint can also be used on aluminum, titanium, steel or stainless steel. The developers selectively adapted individual constituents in order meet the specific demands of interested users.